Mary is a moderator and helps run the AIM blog and Facebook pages. I started making dolls about 7 years ago as a hobby and was lucky enough to find people who wanted to buy them. I have always had a love of history and in particular historical costume. I exhibit my dolls at Autumn Miniatura, at other times dolls are available via my website. 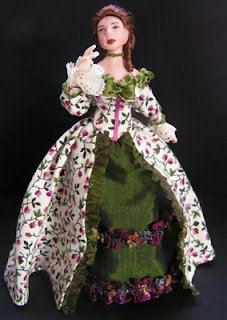 My dolls are made of porcelain and are unsuitable for children. 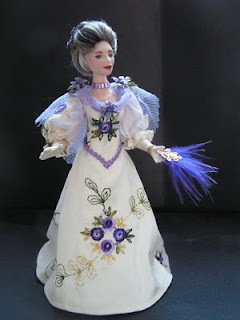 The dolls are dressed in finest silks and antique laces and are in 1/12th scale. Some of the dolls can take weeks to dress and I try to offer a range of historical periods, in particular 1920s styles. All dolls come complete with stands if the doll requires one. I am happy to undertake commissions.